Hay prices moved up for all types in October, according to USDA’s most recent Agricultural Prices report released last week. The all-hay price for October settled at $141 per ton, which was up $5 per ton from the previous month and $12 higher than October 2016. Hay other than alfalfa also was up $5 per ton in October to $118, which was $5 higher than last year. 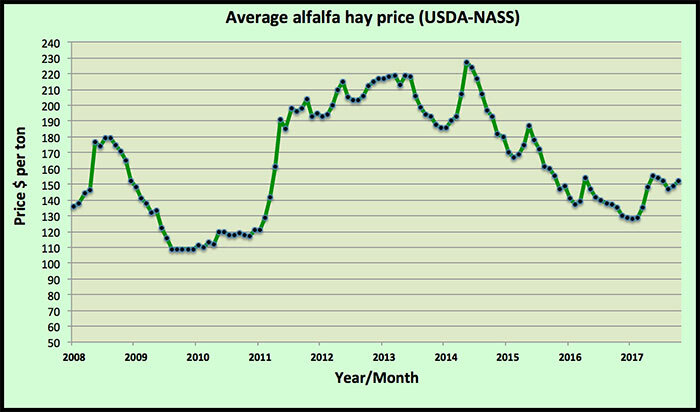 The alfalfa hay average price moved to $152 per ton in October, up $3 per ton over the previous month and $17 higher than one year ago. The October price was $24 per ton above the low set in January. 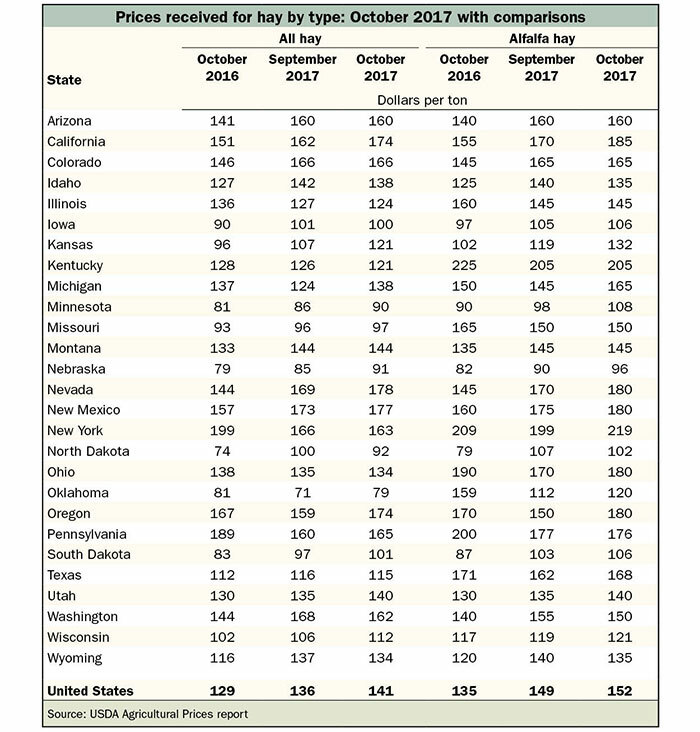 The USDA price averages account for all qualities of hay sold, and the final U.S. estimate is a volume-weighted average rather than a simple average of state values. Those states with the most volume sales will impact the final U.S. dollar value more than those with fewer sales. Leading the alfalfa price gainers were Oregon (plus $30 per ton), Michigan (plus $20), New York (plus $20), and California (plus $15). No state had an average price decline of more than $5 per ton. The highest alfalfa hay prices were reported in New York ($219 per ton), Kentucky ($205 per ton), and California ($185 per ton). Four states had an average price of $180 per ton (Nevada, New Mexico, Ohio, and Oregon). The lowest prices were reported in Nebraska ($96 per ton), Iowa ($106 per ton), South Dakota ($106 per ton), and Minnesota ($108 per ton).